The digital piano Yamaha CLP-430 come with all the capabilities you want in your first piano : realistic sound with RGE (Real Grand Expression) Sound Engine, great touch of grand piano with GH3 keyboard (Graded Hammer 3), recording functions and 50 stored pieces to study. The sound is heard just as it was played. 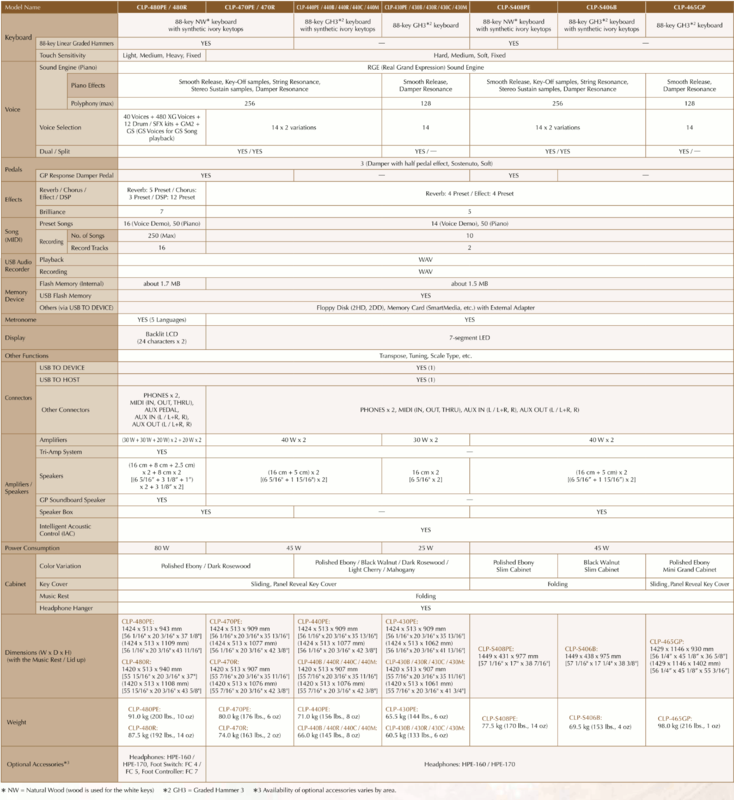 "RGE Sound Engine" provides playing response and expressive capability. The RGE Sound Engine delivers the ultimate expressive capability for the CLP Series. The new CLP Series uses the RGE (Real Grand Expression) Sound Engine, the next-generation piano sound source. It improves upon the Pure CF Sound Engine, which earned high praise in the CVP Series, and lets you enjoy the playing response and expressive capability of a concert grand piano. It features a new Smooth Release function which can express sound with great clarity, and clearly enunciate staccato notes with the sound of lingering resonance heard when gently lifting your fingers from the keys. It succeeds in capturing the essence of a piano performance to create grand piano-like, richly expressive experiences. An acoustic piano is a musical instrument whose sounds linger for a long period. The strength of touch varies not only the volume, but also the sound from bright to dark, creating rich expressiveness. Clavinova produces deep resonances by using piano sounds that have been accurately sampling for their entire length. Proprietary technology creates smooth and dynamic changes according to the strength of the touch. Additionally, to achieve a performance feel rivaling that of a grand piano, the touch was carefully refined by many pianists who played it and gave their feedback for Yamaha’s research and development. The grand piano Voices of a Clavinova were obtained by recording the sounds of a Yamaha concert grand piano that led to the creation of the CFX, the piano selected for a performance by the 2010 winner of the famed International Frederick Chopin Piano Competition. A single piano best suited for recording was selected and then tuned to the finest possible condition by a veteran piano tuner. All the sounds were recorded resulting in a sound that displays not only the beauty of each note, but the harmonized sound of a single piano. When you play fast phrases or superimpose chords while pressing the damper pedal, you want to be able to perform without notes dropping out. The Clavinova provides 128-note polyphony so you can enjoy complex works such as those by Liszt or Ravel, which feature numerous pedal presses, with no limitations. As your playing improves over the years, your Clavinova will continue to let you make the most of your abilities. Clavinovas are provided with distinctive piano voices in addition to the piano voices that offer playing response like that of a concert grand piano. These include a piano for ballads that gently resonates the start-up sound, a piano for jazz that adds depth to the sound, and a piano for popular music with bright, rich sound. To ensure that the sound conforms closely to the genre, adjustment of each piano voice focuses on the resonance, or the sound produced when you lift your finger, and other delicate nuances. Each time you play, you can immediately enjoy the perfect piano sound without having to make any adjustments. The "GH3 (Graded Hammer 3) keyboard" faithfully reproduces the touch of a grand piano. The touch of the Clavinova keyboard has been praised by pianists for a performance feel that makes you forget it’s a digital piano. The secret behind this superior touch is the same hammering system and spring-less mechanism as a grand piano. Depending on the weight of the hammer, the force of your touch and the natural key return when you release it, the Clavinova faithfully reproduces the keyboard touch of an acoustic piano from the heavy feel in the lower range to the light feel in the higher range. 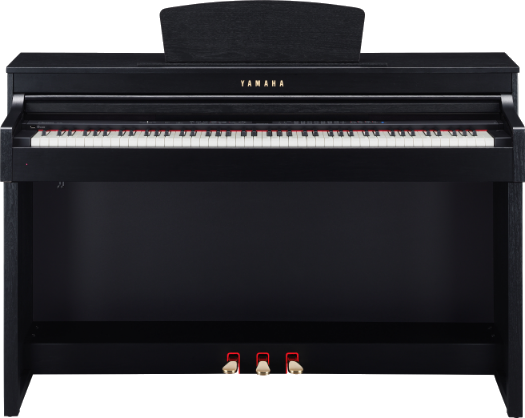 Also important is Yamaha’s unique three-sensor system, which accurately senses and interprets the behavior of the keyboard, just like a grand piano. When playing continuously or with a light trill, techniques used in many pieces such as Für Elise, you can play with a bright, vivid feel. "Keyboard Stabilizers" enhance the keyboard’s durability. The keyboard must respond perfectly to the touch of your fingers so the notes sound just as you intend. Because the keyboard plays such a critical role, it must allow you to play smoothly and maintain good touch for long periods of time. That’s why all 88 keys are equipped with Keyboard Stabilizers. This not only lets you play with a natural touch, it greatly improves the stability and durability of the keys. Keys have a long distance to the fulcrum offering easy-to-play touch, even to the base of each key. The keys provide a pleasing touch down to the base, because the distance from the tip of the key to the fulcrum is extremely long. When playing a piece that uses many black keys, even when you press a white key near its base, the key sinks softly, maintaining the delicate nuances of soft and hard key strokes. The acoustic system produces acoustic piano sound as if the instrument itself is resonating. Because Yamaha places so much importance on the joy of playing, the speakers, amps and other acoustic systems have been optimized so the player hears nothing but stunning sound during a performance. These musical instrument-like resonances give the impression that the Clavinova is more acoustic than it is digital. Pedals that can fully express the emotion contained in a single note. Damper Resonance similarly produces broad and deep resonances when the pedal is used. The result is realistic sound, just as if you were playing an acoustic piano. You will even hear the subtle changes that occur according to whether the player begins to press the pedal before or after striking a key. You can enjoy playing impressionistic pieces, such as those by Debussy or Ravel, where half-pedal expression is important. "Intelligent Acoustic Control" provides a full, balanced sound with rich lows and clear highs even at low volumes. Volume adjustment is convenient for playing at home, where sometimes others may prefer you play softly. You’ve probably experienced the fact that when the volume is low, it is difficult to hear treble and bass. On a Clavinova, however, the Intelligent Acoustic Control (IAC) function automatically adjusts the sound, so you enjoy proper sound balance even at low volumes. Additionally, the volume dial automatically makes fine adjustments to overall sound of the speaker system (EQ) at low volume. This ability to adjust volume without losing the rich and balanced sound is an exclusive Yamaha benefit, ensuring you always play with the utmost sound quality. A full selection of basic functions unique to a digital piano such as sound volume adjustment and metronome are provided. In addition to being compact and not requiring tuning, Clavinova models provide volume adjustment and two headphone jacks so you can listen to your children practice or enjoy playing duets in private. A metronome and other features help you improve your piano skills. Two recording functions can be used selectively according to your purpose. Recording is a useful way to evaluate your performances. You can record with the touch of a button and even do two-track recording, which lets you record the parts for your two hands separately, then play them simultaneously. You can also store performances on a USB memory device. Along with the piano voices, Clavinova also offers a wide selection of musical instrument voices, including electric piano as Yamaha’s CP1, harpsichord, guitar and strings, which you will find many opportunities to use. Dual, which means playing two voices simultaneously, provides a rich sound by overlapping the piano sound with strings. By combining the voices in various ways, you can enjoy many different styles of play. USB ports allow easy data storage and transfer. Clavinovas have a USB TO DEVICE port for plugging-in USB memory devices and a USB TO HOST port for connecting to a computer via a single USB cable. They provide a way to conveniently store performance data, and transfer other data between your Clavinova and computer or other Clavinovas. You can also use it for lessons. Includes 50 famous piano pieces. The stored pieces are a selection of popular piano pieces. These emotion-filled performances are not only perfect for BGM, they can also be used for lessons. You can listen to them as models, reduce their tempo and play along, or play back only the right hand part so you can practice the left hand part. The inclusion of 50 stored pieces is a nice Clavinova benefit. Panel Reveal Key Cover hides the operating panel for a more natural acoustic piano look. The Panel Reveal Key Cover lets you perform with all signs of technology on the control panel discreetly hidden. This adds to the traditional piano-like cabinet design of the CLP-400 Series. Design captures the essential beauty of a piano. Color variations are available. Clavinovas are designed to offer the appearance and presence of an acoustic piano. The luxurious polished finish offers a piano-like texture while other color variations complement any room’s decor. The CLP Series includes slimline models that fit neatly almost anywhere, and a grand piano-like model with its graceful silhouette. The finish has a deep and brilliant piano-like luster, affording a feeling of luxury. The coating, which is resistant to scratches as well as to excessive humidity and temperature, is the same as that used to finish grand pianos. The coating process is also the same, and results in a beautiful luster thanks to repeated grinding and polishing by piano craftsmen.